Deep inside, I had always felt it. A yearning for something different, something out of the norm. I crave for a place less crowded, less intrusive. With plenty of personal space, where you can carry an intimate conversation in relative privacy, away from prying ears and inquisitive eyes. Yes, it is time for a change, I thought. So I went to East Soho instead for dinner on Saturday night. It wasn’t my first time to East Soho. I have walked through the area almost a year back, while on my way back from a weekend excursion in Lei Yue Mun. The sight of bustling restaurants in quiet dignity, as calm residents and visitors carrying on with their business with tack and respect for each other appealed to me. I told myself I will be back. And so I did, some two years later. I asked my friends from #hkfoodbloggers for recommendations. Some swear by Borgo C, the fusion-looking restaurant serving Chinese food while you sit on patio furniture. 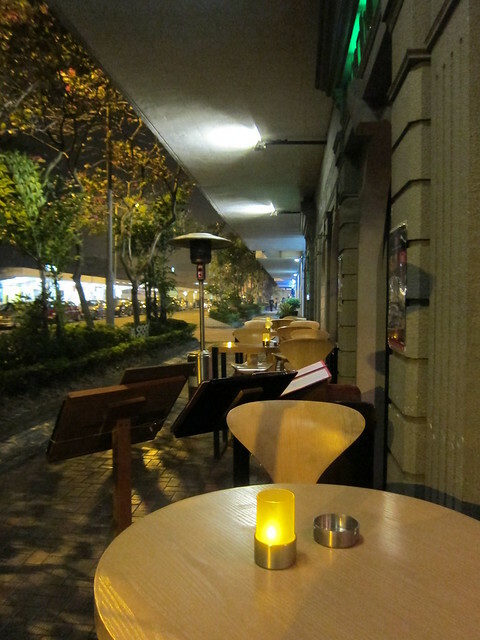 Another recommended Yi Jiang Nan, a small traditional-looking Chinese restaurant with only a couple of tables. Approvals were ringing for Tapeo, supposedly the best tapas restaurant at this part of the island. I am a staunch believer that, if you ask for advice, you take it. But I am also a great friend and put the wants of others over my own. I dithered between the two, and finally the cozy looking sidewalk looking out to the sea at Berliner German Restaurant won me over. To be honest, there was no serious contest between Chinese noodle and a pints of draught German beer. There were four options of the latter at Berliner. 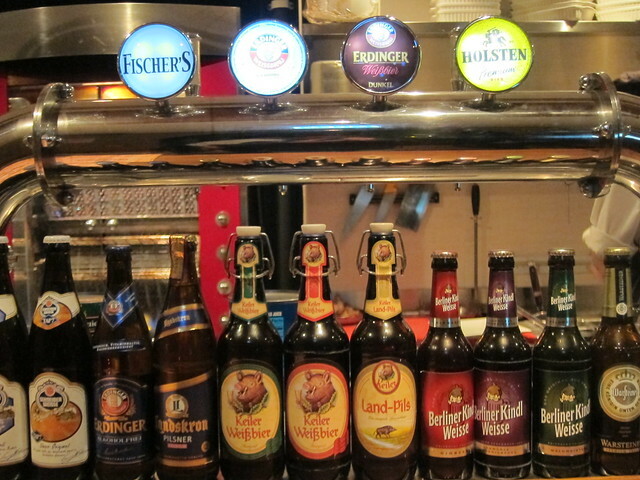 Fischer’s Stiftungsbrau (a lager), Holsten (a Pilsner), Erdinger Weissbier and Erdinger Dunkel. I immediately discounted the Erdingers since you could probably get it anywhere, so it was between the lager or the Pilsner. I was afraid I might be forced into a situation to say stiftungsbräu out loud, so I went for the Holsten. A litre of it, of course. Only wuss goes for half portion for their first drink. Germans are famous for their efficiency and, err, size. (If you are thinking about German sausages, I wouldn’t blame yet. I have very little experience with such sausages, so I wouldn’t know. But if you do, please let me know in the comments below.) (That was a slight detour.) I was given a frighteningly large mug for my beer. It almost occupied two tables on its own, and throughout dinner I went to the toilet so many times that soon I was directing other patrons to it. 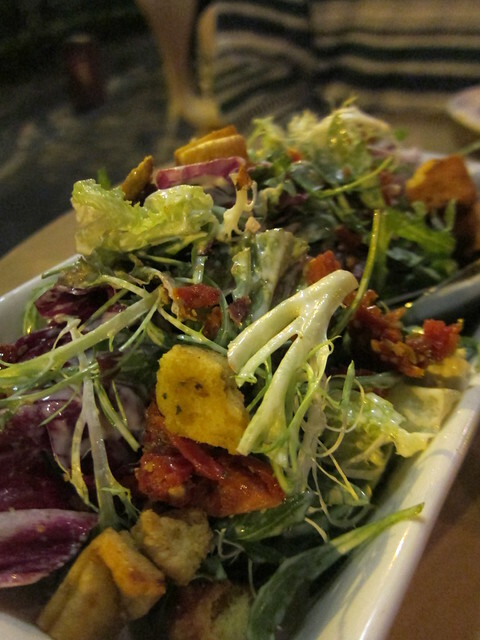 Frische Blattsalate – fresh lettuce with buttermilk dressing, dried tomatoes, crispy bacon and croutons. The menu was by no mean extensive, but that didn’t mean we were having an easy time choosing what to eat that night. In the end we decided not to be a glutton. We did starter right with Frische Blattsalate, a healthy mix of fresh lettuce with buttermilk dressing, dried tomatoes, crispy bacon and croutons. The war was on between lettuce & tomatoes and bacons & croutons, but it was the buttermilk dressing which won the day. We were kept deliciously at the edge of our seats trying to recall where we tasted this before, and by the last strand of lettuce we were nowhere closer to the answer. I like to think of it as a flashback to my Hogwartian self and my love for Butterbeer. Now that’s one salad that got me fantasizing. 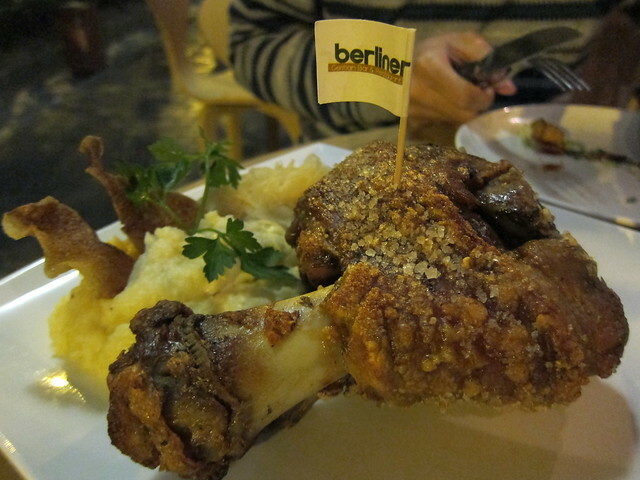 Schweinshaxe aka roasted pork knuckles. The Schweinshaxe aka roasted pork knuckles looked really good on the menu and turned up exactly how we imagined it would look like. The feel-good factor unfortunately, ended there. The knuckle was already a little dry to start with, and as the night wore on it got even drier to the point no amount of mustard made it worth the effort. The skin was crispy to the right degree but alas, was way too salty. The only saving grace on this signature German dish was the mash potatoes – deliciously creamy and fluffy, no additional gravy needed. 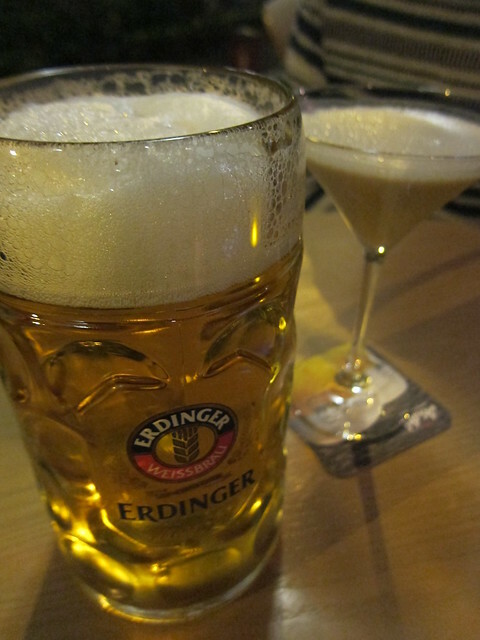 If I had to choose mash between Berliner or La Cantoche, I would have a very, very hard time. Vanilla pancakes with ice cream & warm dark cherries. The night wore out and so was our conversation. The street was quiet but never quite empty. The wintry chill was offset by the roaring fire (heater), and the beer helped. Soon we were craving for food again. As I downgraded to the wuss-level of half-pint Holsten, we perused the dessert menu. 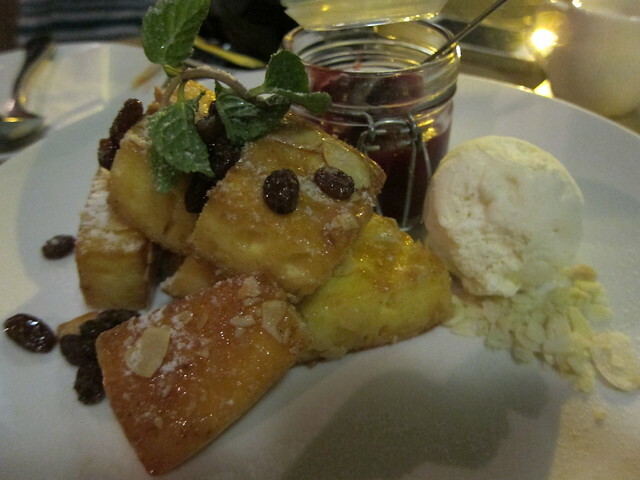 The vanilla pancakes with ice cream and warm dark cherries was divine but would be more aptly named as French toasts (I’m only saying). 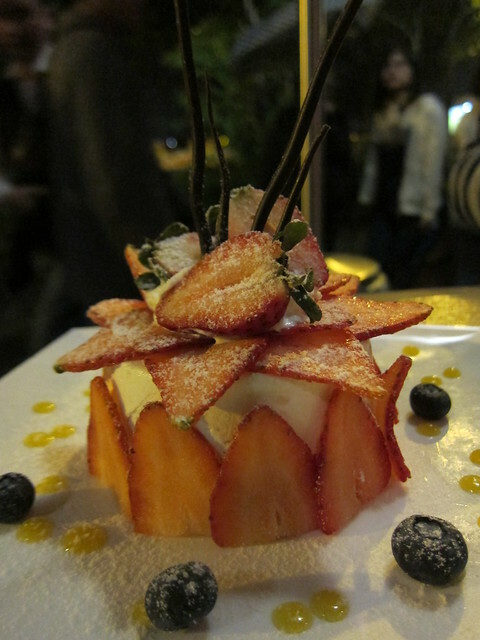 The strawberry pavlova was quite a delight. My opinions could be slightly swayed by the excellent Holsten, but when you mix crunchy, chewy and creamy together, I couldn’t imagine how far wrong one could get. Verdict? 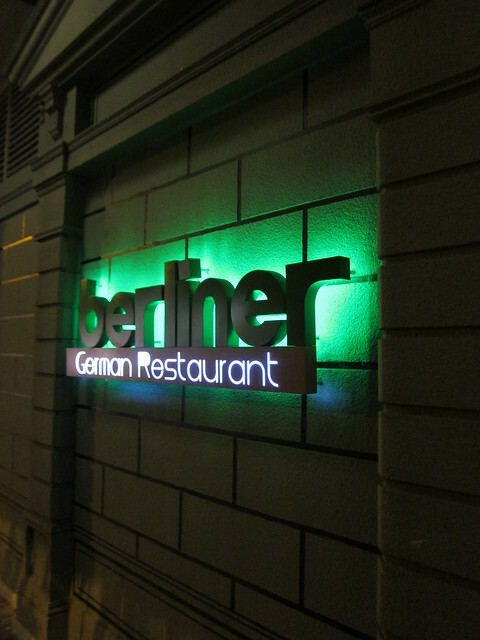 A lovely spot in East Soho for a long night of German food and beer, away from maddening crowds ubiquitous to life on Hong Kong Island. Try it for size.